Neodymium Magnets - Magtech Magnetic Products Corp. The NdFeB magnets are the permanent magnets made of an alloy including Neodymium, Iron and Boron with chemical composition of Nd2Fe14B. It is mixing the ferrite powder and rare earth metal powder with resin, and is formed by either mold compression or injection. Due to without magnetic field while compression, so the NdFeB magnet is available to be formed into a wide range of shapes. However, tooling is always needed, mo matter what the production way be taken. In addition, when taking compression, the dimension can be controlled in a very precise level, which makes the engineers easily to device a light and miniature hi-performance product. Besides, this magnet normally be coated with epoxy or others appearance treatments which makes the product anti-corrosion. The bonded NdFeB magnets are one kind of Isotropic magnet, which can be magnetized with axially or radially respectively. 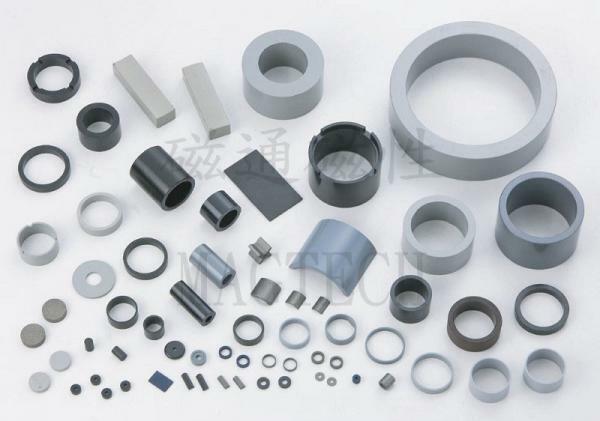 Magtech is a specialized manufacturer of NdFeB Magnets and other permanent magnets with various surface treatment methods including Zine, Nickel, Tin, Silver, Phosphor and Spray Epoxy Resin, etc. Our magnetic products along with high quality value and competitive price are commercially utilized in a variety of applications in different industrial fields. For more details, please feel free to contact us as soon as possible.